New song and those of a more vintage variety, even years after the initial screening, which still got there purely because of a movie. As alluded in another series, the convergence of the music and film arts is one I’ve spent much time toward. I’ll attempt to break these songs up into the categories most fit into, at least for my bizarre thinking, purely to make it more manageable in presentation. Since this category was the largest, I’ll group them by the decade that brought them forth. Again from fewest to most. The decade with the third most up now. A definition for what we’re talking about here (if you’ve dropped into the middle of it). a melody used, esp. in a film score, to set a mood, introduce a character, etc. Somewhere in Time (1980): A theme keyed to the flute and string, John Barry’s piece was the height of soaring romance. Yet, when the piano and flute chime in, it’s supremely forlorn. Get’s me every time. Star Wars: The Empire Strikes Back [Imperial March, aka Vader’s Theme] (1980): Proving John Williams didn’t require a Spielberg film to prove his mettle with a theme instrumental. The Imperial March remains readily recognizable, as Lord Vader demands it. Raiders of the Lost Ark (1981): Okay, John Williams is pretty damn good when he is scoring for Steven Spielberg. Happy now? You only need to play a few bars of this before everyone around identifies this. Must be pretty good to have this cache to pull from, I must say. The Thing (1982): Has there ever been a theme instrumental that was simultaneously badass and grimly foreboding? I don’t think so. Ennio Morricone’s piece registers on those levels, and follows the Carpenter style to a tee. Tootsie [An Actor’s Life] (1982): Breaking away of the dark, Dave Grusin’s main theme for the classic 80s rom-com fit like glove. All the touches for this composer, the melodic keyboards, rhythmic guitar, and sax solo are there, and spice up the strings for his usual fun turn with audiences and listeners. The Right Stuff [Breaking the Sound Barrier] (1983): Music composed and conducted by Bill Conti for this space-bound epic too often gets overshadowed. It shouldn’t as it worked wonderfully for one of the great films of the decade. No YouTube clip is around, but the link provides a clip to a live performance that featured the song. Robocop (1987): Basil Poledouris work for Paul Verhoven’s audacious, violent, Christ-like allegory on film is just fantastic. Wondrous in parts, take-charge in others, it’s just a marvelous mix. Totally fitting. La Bamba (1987): Essentially, a cover of the Mexican-American singer, songwriter and guitarist’s greatest tune, performed by the Los Lobos (who did its superb soundtrack). Originally a Mexican folk song, the late-rock ‘n roll icon Richie Valens turned it into a ’58 pop hit. But it surely rocks. Then, here, and now. The Untouchables (1987): More by the living legend that is Ennio Morricone, an almost sinister, but fun theme instrumental for Brian De Palma’s thoroughly entertaining crime tale. A heart pounding piece, if I do say so, with one memorable and haunting chord running through it. Batman (1989): Way before Zimmer and Howard composed a compelling theme for Nolan’s Batman, but after Neil Hefti’s guitar-riffed, surf rock piece for the ’66 TV series, Danny Elfman’s theme instrumental was the definitive for this DC superhero. Musically, it builds beautifully and still delivers, I might add. Glory (1989): Highlighted by the Harlem Boys Choir, James Horner brought true inspiration to Edward Zwick’s solemn recounting of the 54th Massachusetts with this theme piece. It fills whatever emptiness within me every time I listen to it. How about you? Any theme music from these periods you’ve collected because of a movie? That’s cool. I’d like to check it out, Alex. Give me a link and I’ll give it a look. Thanks so much. Henry V — just the first glimmering of what a superlative composer Patrick Doyle would prove to be. I love the entire soundtrack, from Henry’s theme to the music for the Agincourt speech, to the simple and stunning ‘Non Nobis, Domine’ during the grim aftermath of battle. My selections of film themes date back a bit further. Most on reel to reel and cassette. The Mike Curb Congregation and their ‘Burning Bridges’ rates very high as the theme to ‘Kelly’s Heroes’. A tune that uplifts at the film’s end that also doubles as a kind of Greek Chorus. Issac Hayes’ ‘Shaft’ is a given. Due to its guitar riffs that begins a tune that lays out a character critique right off the bat. Rather cleverly executed, too. ‘Across 110th Street’ fits in nicely as well. Succinct and self explanatory. As well as most of Curtis Mayfield’s offerings from ‘Super Fly’. And John Williams’ theme work on ‘Jaws’ works for its cello introduction. Whose opening six bars could also make a decent ring tone. Any of the many tunes from ‘The Buddy Holly Story’ are well worthy of being recorded for posterity. I listened to that theme from “The Long Good Friday”as I was cruising down Sunset Blvd. with the top down in my 86 Le Baron with the leather seats after seeing “Brazil” in the Beverly Center in January of 86. The sun was out, my car was new, and that tune made me feel like a big shot for about two minutes. Ultra cool moment, Richard! BTW, I accept guest TMT submissions, my friend. Think about it 🙂 Many thanks! Ooh, Indiana Jones by John Williams is a total favorite. And it never fails to remind me of Disneyland. I know what you mean, Fernando :-). Thanks, my friend. Brilliant post! 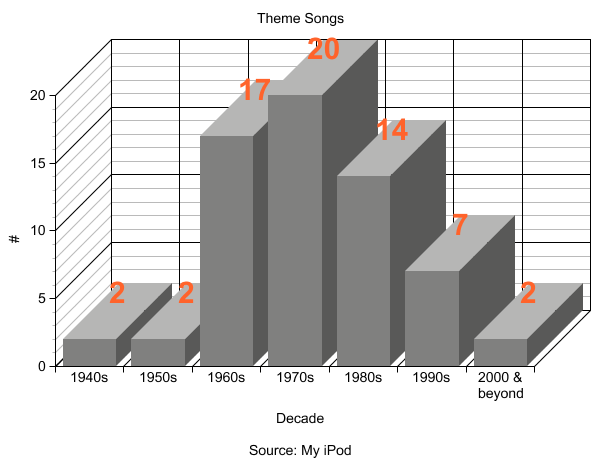 Got me thinking about the music I have on my iPod and I am pretty sure I have loads of songs which link to films. The one that sticks out in my mind right now is ‘Wild is the Wind’ by Nina Simone as I first heard it in the Revolutionary Road trailer! Welcome and thanks, Caz. Great selection!